This trek is designed to offer a Adventures challenging outlook on the Everest region and its greater inhabitants, Sherpa’s. Offered in a reasonable budget, this 12 days trek culminates into an adventure travel along with sightseeing and cultural immersion. You have three main options on how to do the trek to Everest Base Camp; you can do a package tour through an agency, hire a porter and/or guide or do it yourself. – Doing an organized tour through an agency is easy but expensive and you will probably be in a big group with someone carrying your bag and organizing where you stay. -Finding porters and guides in Kathmandu is easy you can contact Sanjib (Nepal Guide Info team). We did not find this necessary, you follow a very clear path, everybody stays in the same little “towns” with many tea houses, it is not necessary to pre-book anything. -Doing it yourself is not hard and plane tickets from Kathmandu to Lukla is the only thing that you have to organize. You walk 5 to 8 hours a day for 12 days, with a resting day or two for acclimatization. If you are reasonably fit you should be able to do this carrying your own backpack. Having porters make it even easier. The biggest possibility for saving money on the Everest Base Camp trek is by going from Kathmandu to Lukla overland (mainly on foot). Flying costs about $165 one way (we flew to Lukla and ended up walking back). An alternative is to do this overland. You can take a bus to Jiri (9 hours) combined with a five day walk to Namche Bazaar. Resulting in an extra four days of trekking. You can do the same back or you can walk from Lukla to Selirri (2 days) and take a back breaking jeep journey to Kathmandu for $20. 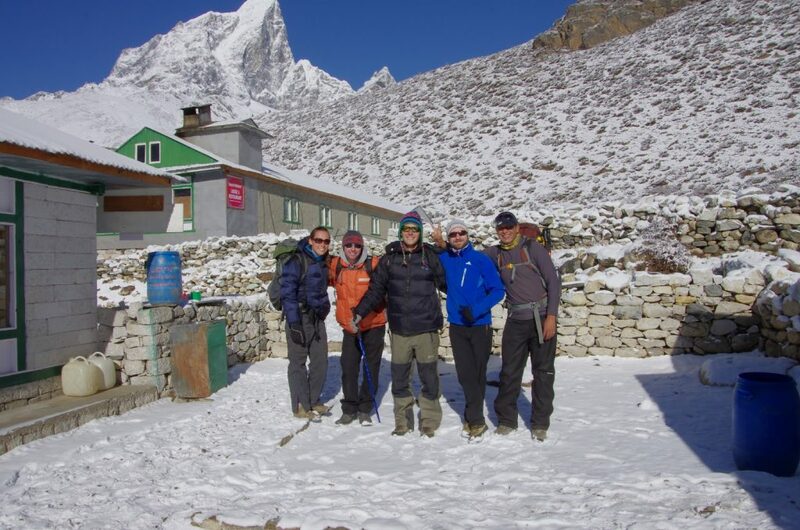 If you organize the trek to Everest Base Camp yourself it is easy to arrange a guide and a porter in Kathmandu. You did not feel a guide would have been an advantage to us at any stage on the trek. You just follow the path and there are many other trekkers on the route and places to stay. If you feel you cannot carry your own bag you can arrange a porter for your trek for 16$ a day. A porter can carry up to 30kg of luggage, since he put it into a basket anyway size does not matter. Two people can thus share a porter; if you are alone he can also double as company. It is my understanding that you do not pay for meals for the porter; they usually get food if they arrive with you at a guesthouse (for bringing you there), but confirm with the porter/agency. You can buy all clothes and gear necessary to trek to Everest Base Camp in Kathmandu for very cheap. Most of the stuff is fakes of well-known brands e.g. The North Face but the quality was good enough for the temperatures that we experienced during the Everest EBC trek. There is bedding in the teahouses, but you will need a sleeping bag, you rented one for about 1$ a day per days in Kathmandu , ‘The North Face’ sleeping bag, it looked good but was terrible quality. A sleeping bag rated to 5C should by sufficient. A gear list top to bottom: Beanie, sunglasses, 3 T-shirts short sleeve, 1 long sleeve, waterproof warm jacket, thick windproof gloves, 2 pairs of waterproof trekking pants, thermal underpants, 4 pairs of socks, trekking boots, 1 hiking pole, backpack, flip flops, headlamp, kindle (lots of reading time at night), camera + 2 batteries. (Total weight 12kg) I would recommend that you also buy 2 quick dry t-shirts you sweat going uphill in the sun wearing a jacket and become soaking wet and cold in normal cotton t-shirts. AMS Symptoms: poor appetite, fatigue, headaches, dizziness, difficulty sleeping, if you have only have mild headaches you should be OK, but be careful AMS is dangerous and trekkers have died on EBC ignoring it and pushing through. You can ask the advice of the experienced Sherpa’s that own many of the tea houses. At Periche there is a clinic with international doctors working there and a daily talk on AMS. Remember if you keep on pushing through severe symptoms and you do not have insurance a helicopter to take you down can cost a couple of thousand dollars. Day 01: Arrival day in Kathmandu International then transfers to Hotel. Day 02: Fly to Lukla at 2840m (9088 Ft), then trek to Monju at 2610m (8352 Ft). Day 03: Trek from Monju to Namchebazaar at 3440m (11008 Ft). Day 04: Trek from Namchebazaar to Tengboche at 3860m (12352 Ft). Day 05: Trek from Tengboche to Dingboche at 4410 (14112 Ft). Day 7: Trek from Lobuche to Gorekhshep at 5140m (16448 Ft), then trek to Everest Base Camp at 5364m (17165 Ft). Day 8: Hike to Kalapathar at 5550m (17760 Ft), then back to Pheriche at 4240m (13568 Ft). Day 19: Trek from Pheriche to Namchebazaar at 3440m (11008 Ft). Day 10: Trek back to Lukla at 2840m (9088 Ft). Day 11: Fly back from Lukla to Kathmandu at 1300m (4160 ft) then transfers to hotel. Day 12: Departure for home. Note: Due to the bad weather of domestic flights from Kathmandu to Lukla and after the trek from Lukla to Kathmandu delayed sometimes by a few hours or canceled for a day or more. It could happen even in best trekking season also as you know how climate changes affecting in the world and especially Himalayan Region of Nepal. Perhaps Nepal Guide Info Team always recommend you to add supplement nights in Kathmandu after your trek if possible. If everything goes well, you can enjoy other activities like sightseeing, White water rafting, wildlife activities, shopping, as you wish for those extra days. However, if you want a helicopter rescue instead of flight cancellation from Kathmandu to Lukla and Lukla to Kathmandu we can organize according to your request.